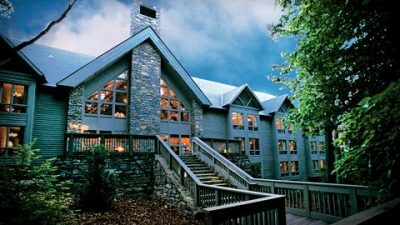 The Cove is a 1,200 acre getaway in Asheville, North Carolina where gifted Christian leaders, teachers, and speakers guide people in studying God’s Word. We invite you to come with a friend, spouse, or a group and discover that the greatest thing about The Cove is what you take home: life-changing truths that will produce a harvest of righteousness in you and those around you. Upon visiting The Cove property, Mr. and Mrs. Graham had a dream of providing a place where people could leave the demands of daily life, come to study God’s Word, and be trained to reach the lost for Christ. The Billy Graham Evangelistic Association (BGEA) purchased the current property in 1972. In 1987 the BGEA Board of Directors approved the Billy Graham Training Center at The Cove to train people in God’s Word to win others to Christ. Today, programs at the BGTC are offered year-round and feature leading Bible teachers from around the world. The Cove teaches people to know God better, know God’s Word, build godly relationships, and help others know God. Billy and Ruth Graham each expressed their vision for The Cove with four words. Billy dedicated it as a place of impact, intercession, instruction, and inspiration—a sanctuary where men and women are equipped by God’s Word for evangelism and discipleship. Ruth Graham prayed The Cove would be a place for retreat, rest, relaxation, and renewal, a refuge where hospitality is a ministry. Her desire was to create an environment where people can meet with the Lord Jesus personally and privately—and never be the same again. Each year those prayers continue to be answered for tens of thousands of guests.